My name is Casey Long, and I am the youngest of the six children my parents raised in Gallup, NM. I currently work for a nonprofit called Community Outreach and Patient Empowerment (COPE) and recently been accepted to Grand Canyon University for my Masters in Public Health. Looking back on my upbringing, I am thankful for my parents; they have taught my siblings and myself many valuable lessons that we still hold close to our hearts and they’ve sacrificed almost everything to ensure happiness for us. Unfortunately, many youths on the reservation do not have a stable environment to be raised. When I look at my nieces, nephews, and other small children on the reservation; I often reflect on who I am as an individual, I look at the support system I came from, and I look at my responsibilities as a Navajo uncle to help the young people. I think my older siblings helped me so much when I was younger and helped me find my desire to help others. I started doing work for my community after I graduated from college in 2016; I used to work for another nonprofit called Wings of America. 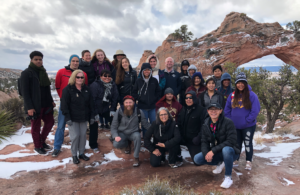 With Wings of America, I was a Summer Facilitator, and I used to travel across the Navajo Nation to provide running & fitness camps to youth ages 6-18. This experience was an eye-opening for many reasons: I have met youth who had one or both parents in prison, youth who have been in multiple foster homes, or youth whose parents do not make enough financially that they often find themselves hungry at the end of the day. I knew this organization was good because they are providing the education to keep young people active and how to live a healthy lifestyle, but I knew it was not enough. In late 2016, I continued working with youth with COPE. Through COPE, we work with the youth leaders to help provide resources for them to make changes within themselves, their families’, and their community. We hope that young people can speak for themselves, visit new places by presenting at local or national conferences, and learn how to make changes in their lives. 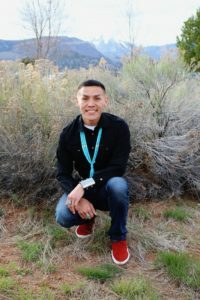 With this position, I am continually working with the youth; I often meet with them on monthly bases, help organize a Writing Conference and Navajo Nation Youth Leadership conference, and I get to talk with the youth at a more personal level. Ultimately, I enjoy this work because I want the best for the youth I work with and I hope they get over any hardships that may get in the way.